If you count ounces when you backpack and prefer to eat with chopsticks, then Burton had you in mind when it made the Flip Sticks. 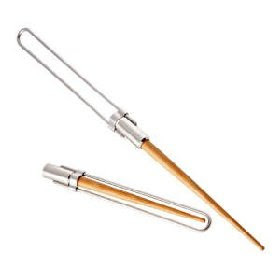 Brunton Flip Sticks chopsticks are made of durable, lightweight bamboo attached to metal holders. These chopsticks flip closed, so they not only weigh a mere 1.6 ounces in your pack, but they also take up less room than the toothbrush you sawed the end off of to save on weight. I'm going to the store. Does anyone want anything?